Olugbenga Famodu's career was influenced by the strong science education he got during nine years in his parents' native country of Nigeria. 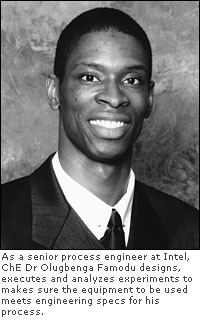 Today he's a senior process engineer at Intel's TMG ramp organization in Hillsboro, OR. He earned his 1995 BSChE and 2005 MS and PhD in chemical/materials science and engineering at the University of Maryland, College Park. After high school in Nigeria, Famodu returned to the U.S., where he was born, at the age of sixteen. "From early childhood my career plan was to become a medical doctor," Famodu says. He went into ChE as a path to medical school. But in college Famodu was active in the Black Engineers Society, a chartered chapter of NSBE, and "Through my involvement with this organization on campus I developed a love for engineering," he says. He also developed his leadership skills on the chapter's executive board and two NSBE regional executive boards, and when he got his BS he became the coordinator and academic advisor for the National Science Foundation's Louis Stokes Alliances for Minority Participation program (NSF LSAMP) at his school's Center for Minorities in Science and Engineering. For three years Famodu advised engineering students and provided career guidance while working on his MS degree. He loved the job, but he couldn't shake the "engineering bug," he says, so he moved into an EnvE/manufacturing internship with DuPont Chemical Co in East Chicago, IN, working on colloidal silica coatings and wastewater management. He spent nine months there followed by another semester on his MSE studies. Then came another internship, this time with DuPont's experimental R&D facility in Wilmington, DE. There he worked on catalyst development and characterization and pilot reactor design for another nine months before returning to complete another semester of his masters. In 2000 he worked at a DuPont facility that made hydrofluoric gas for the semiconductor industry before returning to school for his final two semesters. He was awarded an NSF Sloan Scholarship and GEM graduate fellowship to pursue his PhD, and focused his studies on magnetron sputtering of ferromagnetic shape-memory alloys and high-K dielectric pulse laser deposition. Before he completed the PhD work Intel called him for an onsite interview in Oregon. He was impressed with the D1D ramp concept the company was employing, as well as the hiring manager's interest in what Famodu's own concerns might be. "This factored into why I chose to come and work for Intel," he says. Today, as a senior process engineer, Famodu designs, executes and analyzes experiments to make sure equipment meets engineering specifications for his process. He works with the equipment supplier to identify shortcomings, and to propose and evaluate hardware modifications. He even works on the manufacturing line from time to time to figure out how to integrate the many individual steps necessary for the manufacture of complex microprocessors. He says his leadership experience, planning and coordination with NSBE and the Center for Minorities in Science and Engineering have been invaluable in his current work. His diverse background has helped as well. "I'm used to working across cultures, bridging barriers so I can relate to a very diverse group of people. I can relate to colleagues' experiences and listen not only to enjoy different accents, but to understand what people are trying to tell me.